These five in-depth "packages" (documents) were created by Michael C. Matte in 1986. 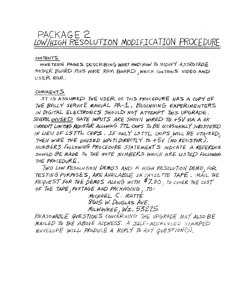 These documents explain how to upgrade a Bally Arcade/Astrocade from the "Consumer Mode," which uses the low-resolution display (160x102 pixels), to "Commercial Mode," which uses the high-resolution mode (320x204 pixels) used in arcade games such as Gorf and Wizard of Wor. 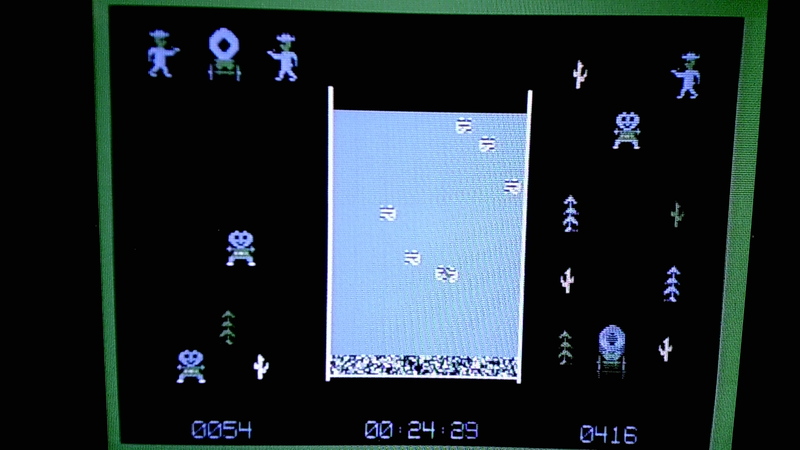 In August 2017, Michael Matte continued to work on some projects with his Astrocade that he upgraded from the Bally's standard low-resolution (160x102) to High-Resolution (320x204) in the mid-1980s. Near the end of August 2017, he took a screenshot of a hi-res demo that he wrote to test the unit. For details about the picture, read this summary. Besides the obvious QWERTY keyboard addition, there is also an external keypad. 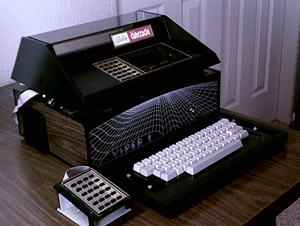 Although the system has a Viper attached to it, that is only the case: the actual Viper hardware is not inside there, instead, it contains Michael's hi-res upgrade. These are screenshots of Michael Matte's Hi-Res Astrocade. 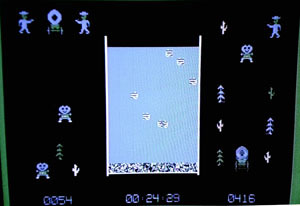 Included screenshots are of the low-res game Gunfight and the low-res menu running on a hi-res system. 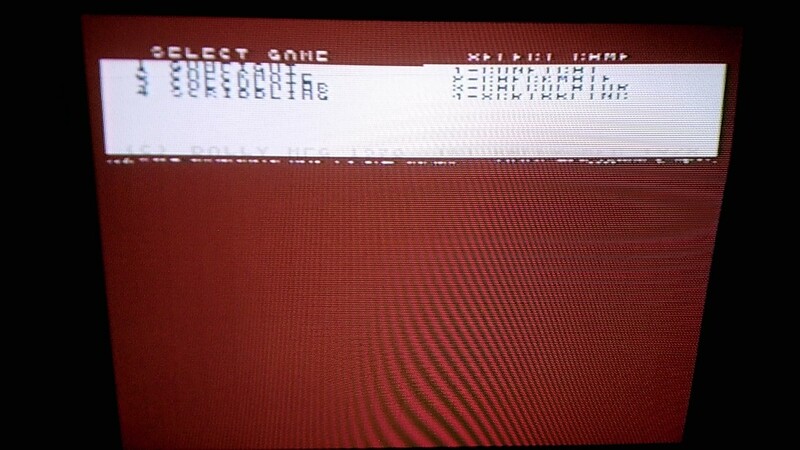 The final screenshot is a version of the MLM (Machine Language Monitor) cartridge that has been specially modified to work with the Michael's hi-res system. 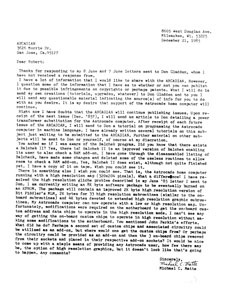 Michael Matte initially sent two letters to Don Gladden (who was the editor of Volume 6 of the ARCADIAN) and one letter to Bob Fabris (who replied to Michael's letters to Don). 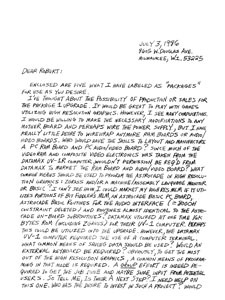 These letters talk about his work on his hi-res upgrade, other Astrocade-related projects and Michael expresses an interest in writing machine language tutorials for the ARCADIAN newsletter. 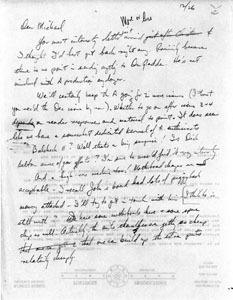 June 7 and 8, 1985. These instructions were sent to Bob Fabris on July 3, 1986. 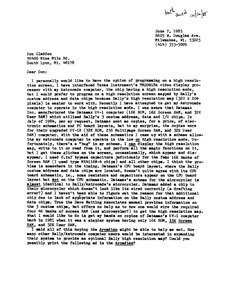 This two-page letter gives an overall view of the five packages. 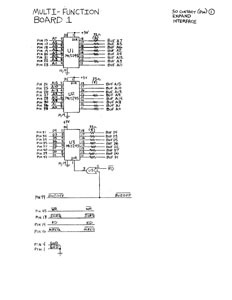 RAM Board Video RAM Schematic - Type 4116 dynamic RAM is used in lieu of type 4027, since it is generally cheaper and easier to obtain. Audio/Video Board Layout - Type LM377 audio amplifier chip is probably discontinued. Other audio amplifiers can be substituted. Radio Shack, for example, has several audio amplifier chips. 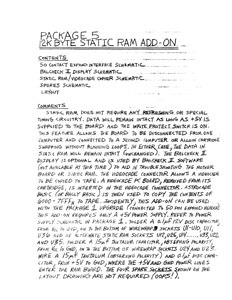 Nineteen pages describing what and how to modify the Astrocade motherboard, plus how to wire the RAM board, which contains video and user RAM. It is assumed the user of this procedure has a copy of the Bally Service Manual PA-1. Beginning experimenters in digital electronics should not attempt this upgrade. Several unused gate inputs are shown wired to +5V via a 10K current limiting resistor allowing TTL chips to be occasionally substituted in lieu of LS TTL chips. If only LS TTL chips will be utilized, then wire the unused inputs directly to +5V (no resistor). Numbers following procedure statements indicate reference should be made to the note numbers, which are listed following the procedure. Two low resolution demos and a high resolution demo, for testing purposes, are available on cassette tape. Mail the request for the demos along with $7.00, to cover the cost of the tape, postage and packaging. 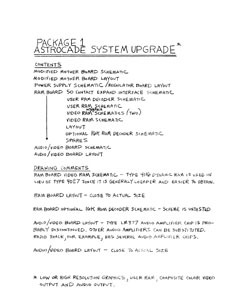 These schematics were used to come up with the Astrocade system upgrade package 1. Comparison of the schematics will show the similarities of the Astrocade upgrade with the Datamax UV-1R. For a complete set of Datamax UV-1R schematics and layouts (excluding power supply) contact DataMax Inc. I paid $30 for one set of prints (21 drawings). 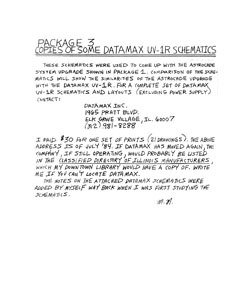 The notes on the attached Datamax schematics were added by myself, way back when I was for studying the schematics. 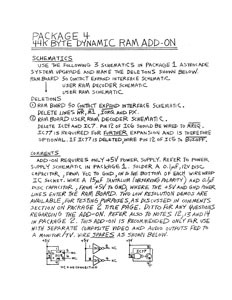 This one-page instruction sheet uses three schematics in "Package 1 Astrocade System Upgrade" to make some deletions for this upgrade. Add-on requires only +5V power supply. Refer to power supply schematic in Package 1. 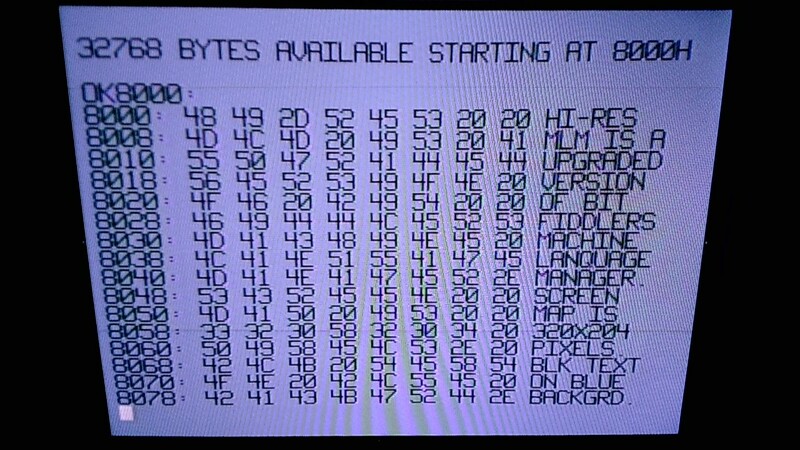 This add-on is recommended only for use with separate composite video and audio outputs between monitor/TV. Static RAM does not require any refreshing or special timing circuitry. Data will remain intact as long as +5V is supplied to the board and the write protect switch is on. 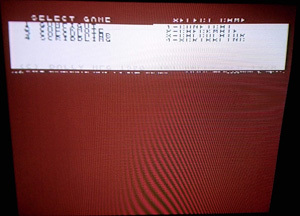 This feature allows the board to be disconnected from one computer and connected to a second computer or allow cartridge swapping without running loops. 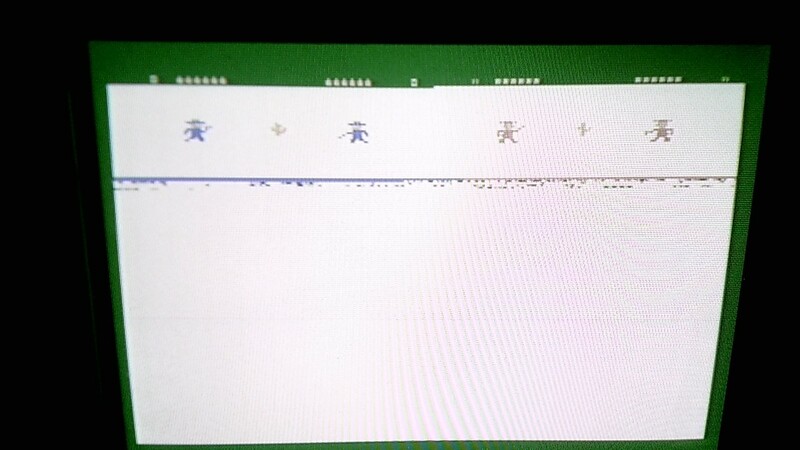 In either case, the data in Static RAM will remain intact (unchanged). 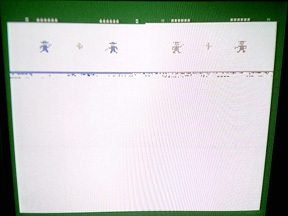 The Balcheck II display is optional and is used by Balcheck II software (not available at this time) to aid in troubleshooting the motherboard or static RAM. The videocade connector allows a videocade to be copied to tape. A videocade PC board, removed from its cartridge, is inserted in the videocade connector. 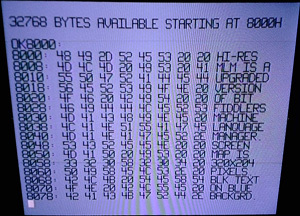 Astrocade BASIC (or Bally BASIC) is then used to copy the contents of 6000-7FFFH to tape. Incidentally, this add-on can be used with the Package 1 upgrade (connected to 50-pin expand header). This add-on requires only a +5V power supply. This document is six pages of directions, schematics and layouts. Since image files are compressed in a PDF document I have included some of the package schematics and layouts in PNG or TIFF uncompressed versions. Note that these uncompressed images are included in the original PDF documents. These uncompressed versions are for somebody that needs a really good look at the schematics because they are actually building the hi-res upgrade. 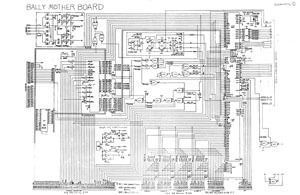 Includes: Bally Motherboard Schematic, Bally Motherboard Layout, Video RAM Schematic and Video RAM Layout. 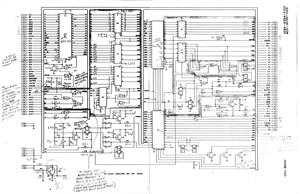 Includes three schematics: CPU Board, Multiple Page Screen RAM, and "Video Board" Detail. Includes: 50-Contact Expand Interface Schematic, Balcheck II Display Schematic, Static Ram / Videocade Copier Schematic, and Layout.